Nick Twisp has just found the girl of his dreams. The downside is neither her parents or the girl are sure Nick is the one for her. In order to win the girl of his dreams Nick must reinvent himself proving he is as bad as she desires. Adapted from the popular C.D. Payne novel of the same name "Youth in Revolt" is a comical coming of age tale that does a solid job of capturing teenage emotion and angst. The teen comedy is filled with well timed laughs, hilarious scenarios and some quality performances from the entire cast. Michael Cera delivers his best performance to date in dual roles. I am a fan of Cera, but have grown tired of his routine character. Luckily here in "Youth in Revolt," Cera is givien the opportunity to break the mold and he does a fabulous job with his created alter-ego Francois Dillinger. As for the typical part to Cera's performance as Nick Twisp, Cera has the awkward and quick-tongued teen down pat, but we've seen him play the role before. The meat and the best laughs come from Francois and Cera's ability to change it up. The rest of the cast is pretty strong, but they come in and out so often and in such a misplaced manner that it is hard to connect with anybody other than Nick Twisp (Michael Cera). Zach Galifiannakis' short lived role in "Youth in Revolt" ends up feeling bittersweet considering he delivers yet again a side splitting comedic performance. Fred Willard and Steve Buscemi also feel undercut in their risible portrayals. What makes "Youth in Revolt" so much fun is it's ability to capture all of the emotions of our teenage years and place them in hysterical situations, that feel natural. Most males can remember back to that first girl that stole your heart. The one that had us thinking we would do anything to have her. "Youth in Revolt" takes those emotions and puts them into a 90 minute romp of continual laughter. The film does have a few adult situations that are probably a little too much for younger audiences (hence the R rating). On the other hand, it is a comedy that I would allow my sons to see at 14 or 15 years old. Director Miguel Arteta delivers a near spotless adaptation of C.D. Payne's original cult novel. Outside of a few rough transitions in various moments, Arteta delivers a fluent film that avoid many of the typical romantic comedy pitfalls. Screenwriter Justin Gash (Charlie Bartlett) also does a bang-up job on what could be perceived as garrulous dialogue. On a final note, I must give a ton of praise to the untraditional animation that is used in a few segments. Solid stuff. 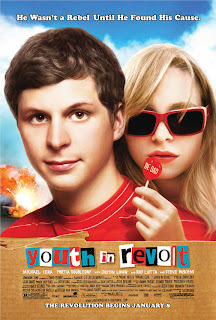 Overall "Youth in Revolt" is ideal comedy to start off the New Year. Michael Cera and the rest of the cast do a uproarious job in creating another teen comedy that captures the angst and emotion of our teenage years. Like other great teen comedies "Youth in Revolt" is sure to become one that stands the test of time.